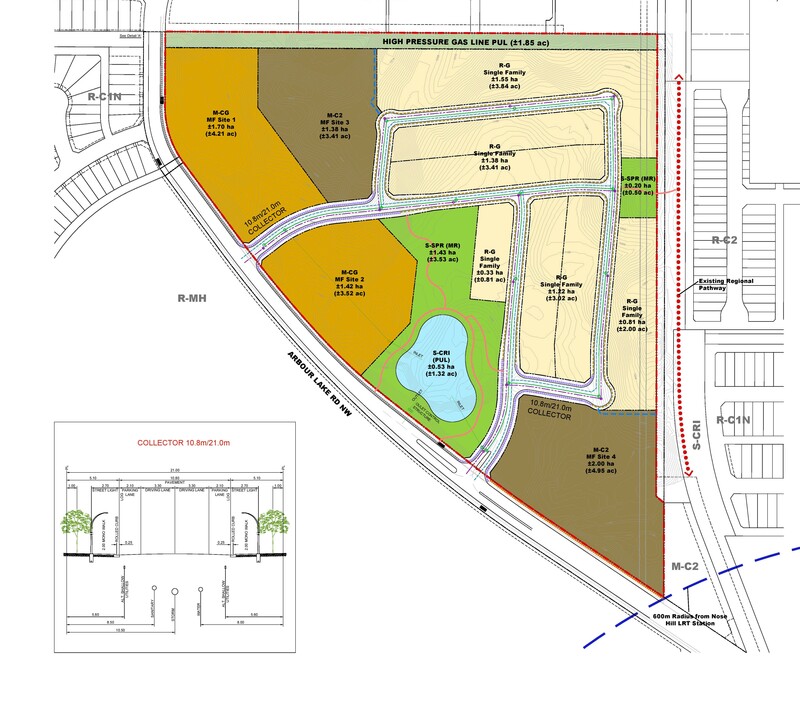 We’ve received an application to rezone and develop the “Hawkwood Farm” property, located in the community of Arbour Lake in Northwest Calgary. In June of 2017, Hopewell Residential submitted an application (LOC2017-0160) to develop the former Hawkwood Farm in Arbour Lake. 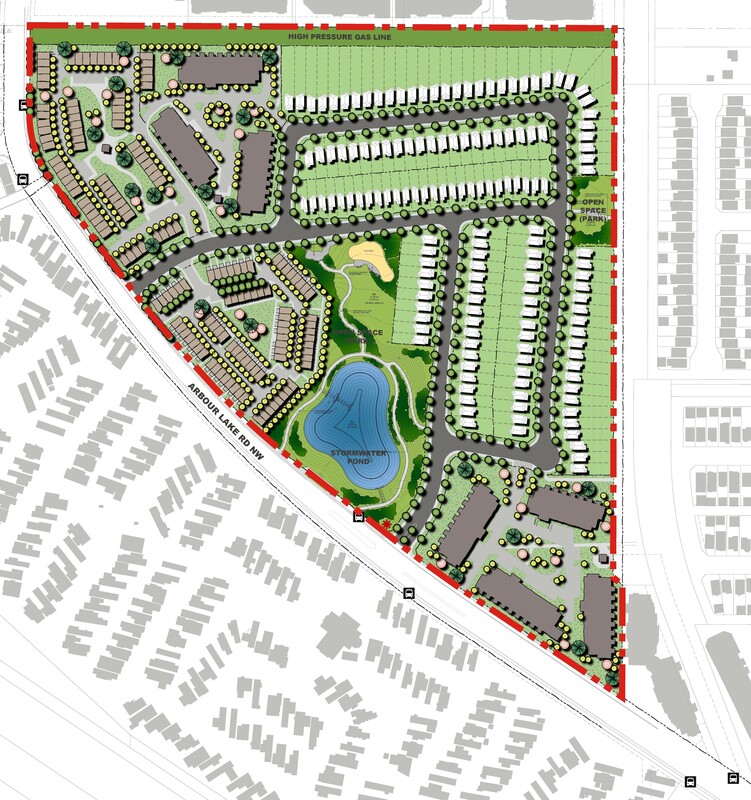 This final plan proposes to build a new residential community that includes approximately 805 new residential units. The proposal includes a mix of housing types including single detached dwellings, townhouses and low to mid-rise apartment buildings (approximately 4 to 6 storeys). The proposal also includes new streets, public parks, public pathways and an environmental reserve in the form of a retained wetland and vegetated buffer. Throughout 2017 and 2018, The City has collected feedback from the community on the proposal and completed a series of technical reviews of the plans and information submitted by Hopewell. Feedback from citizens and technical input from The City has formed the basis for discussions with the Applicant on desired changes to the plan. As a result of this review process a number of changes to the proposed plans have been made. More information on the nature of these changes are found below. ln July 2018 the City received the final version of the plans from Hopewell and the City concluded its citizen engagement program. At that time, an information session was held for residents learn more about the final application, learn how public feedback has been considered through the process and how to participate in the Council public hearing. The details of the final revised application are found on this page. To view the information panels for the July information session, please click here. Since August 2018, the application has been “on-hold” with The City while Hopewell worked with Alberta Environment and Parks on relevant approvals regarding the water bodies that currently exist on the site. As a framework to proceed has now been finalized, City Administration intends to advance the plan to the Calgary Planning Commission for consideration and ultimately to City Council for a Public Hearing. Dates for these meetings are noted in the “Timeline" section of this page. Why is The City considering this application? The former Hawkwood Farm is a privately owned piece of land. The landowner has the right to apply to The City through a land use redesignation application, to change the way they use their land. The City is obliged to conduct an impartial review of these applications. 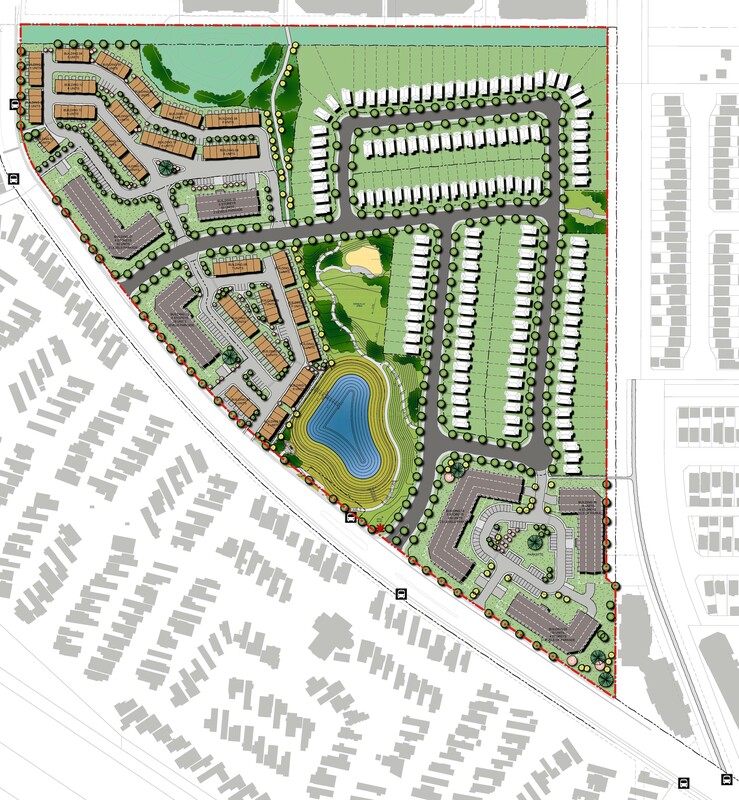 This application proposes to change the current land use designation (zoning) of this site from Special Purpose Future Urban Development (S-FUD) District to a range of multi-residential and low density residential land uses to allow for the development of a range of new housing. 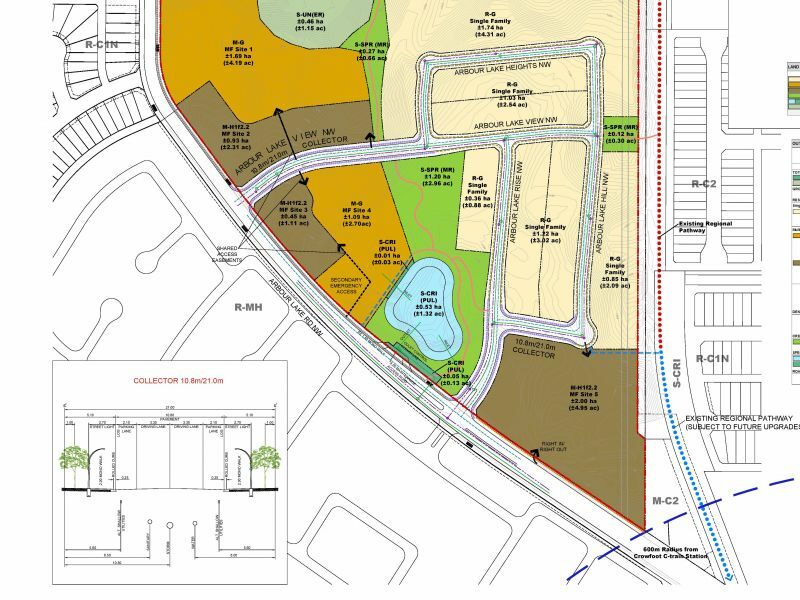 The Outline Plan for this application lays out the framework for future subdivision of the “Hawkwood Farm” property and establishes the configuration of streets, accesses, park space, pathway connections and servicing requirements. A Master Plan and Design Guidelines has been created by the Applicant to provide direction and guidance for future development permit applications for buildings on the site. The information below outlines the major changes made to the application based on the feedback from community members and the technical review conducted by The City. Citizens expressed a desire to retain more of the natural features that currently exist on the site and increase the overall green space. The final revised plan includes over 25% more green space as a result of the retention of an existing wetland and vegetation in the northwest portion of the plan area. Citizens expressed concerns about the overall density of the proposed development and the potential additional strain on infrastructure and services in the area. 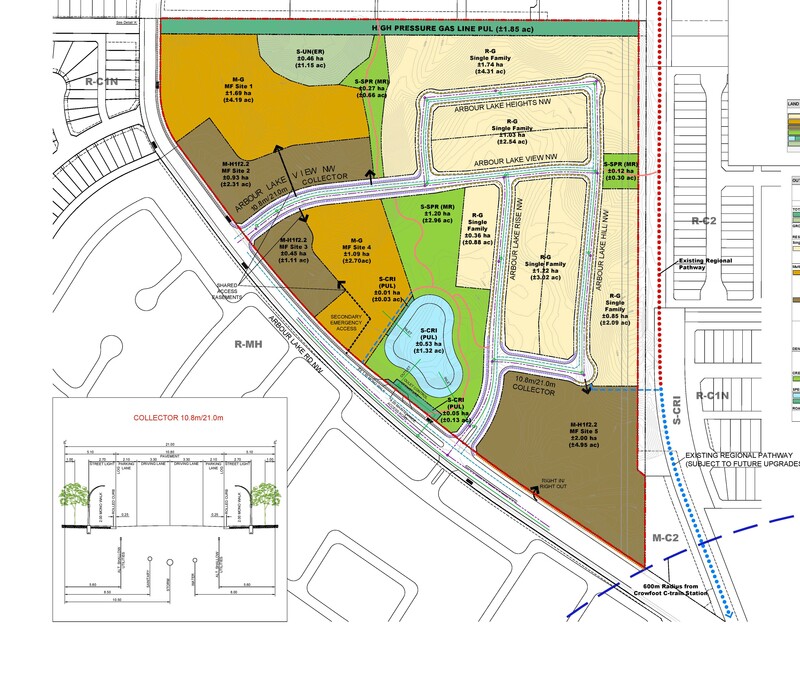 As a result of the retention of an existing wetland and vegetated area in the northwest portion of the plan area and associated limitations on the potential for grading of the surrounding area, the overall anticipated number of housing units for the site has decreased from 890 to 805 (9.5% decrease). 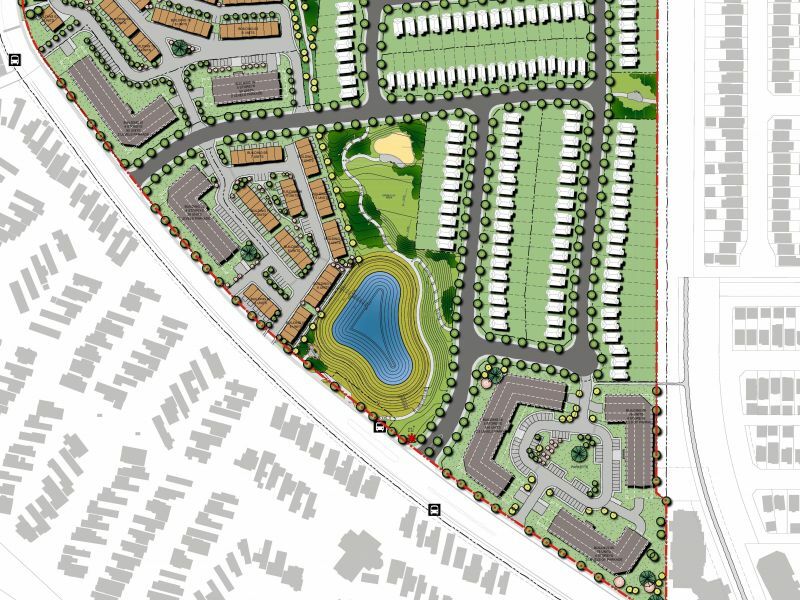 During phase one of the engagement process, citizens expressed concern about the proposed locations of apartment buildings and the potential for them to block existing views from their homes. 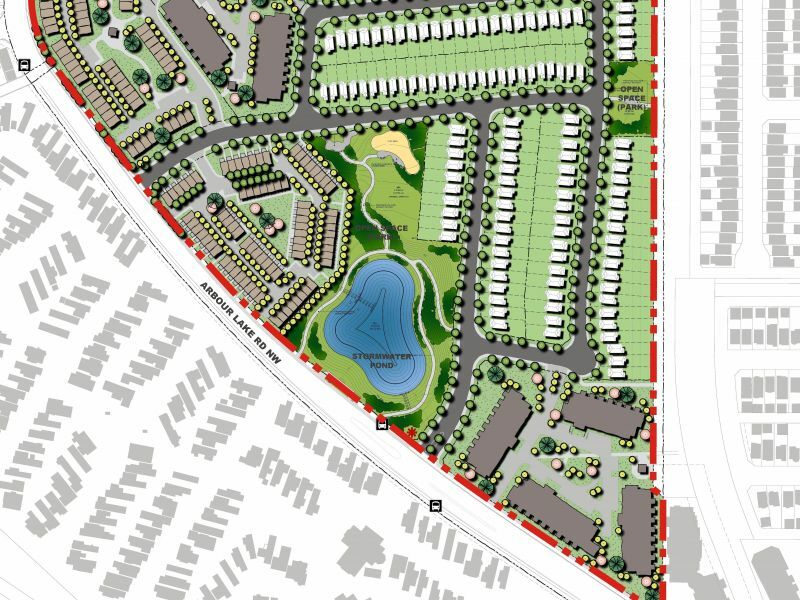 The final revised plan reconfigures the location of the apartment buildings by locating them away from the north and east property line and closer to Arbour Lake Road. This will provide a better buffer between existing residential uses to the north and serve to mitigate concerns about loss of views. Citizens mentioned that they would like to see and access points throughout the area, to improve walkability. 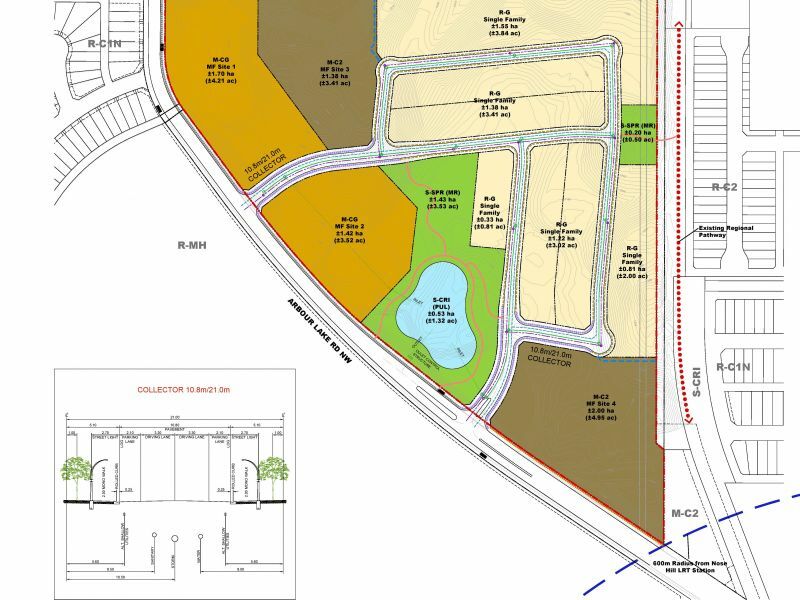 The final revised plans introduce two new publically accessible walkways that will connect to Arbour Lake Road. These connections will allow for greater ease of access to transit services on Arbour Lake Road and introduce a new urban design feature that will provide additional public benefit. Thank you for providing your feedback through our engagement program. The What We Heard Report from previous engagement can be found in the document library along with the information boards which were presented at various events. Feedback received through our engagement program has been used to inform the review of the application and has resulted in changes to the plan to better fit with the local context. Engagement results will also be included in the reports shared with Calgary Planning Commission and Council. In July 2018, after a comprehensive review and citizen engagement process, the City received the final plans from Hopewell that represent the culmination of efforts to address citizen feedback and technical comments from the City. Since August 2018, the application has been “on-hold” with The City while Hopewell worked with Alberta Environment and Parks on relevant approvals regarding the water bodies that currently exist on the site. As a framework to proceed has now been finalized, City Administration intends to advance the plan to the Calgary Planning Commission (CPC) for consideration on May 2, 2019 and ultimately to City Council for a Public Hearing on June 17, 2019. You can watch both the CPC and Public Hearing online here. For information in how to participate in the public hearing of Council please click here. All feedback received through our engagement program will be summarized in all reports to Calgary Planning Commission and Council. To find out how you can participate in the eventual public hearing of Council, please click here. Application is circulated to City departments. The City reviews the amended application and share it with citizens. Final land use application submission. Presentation to Calgary Planning Commission. Please click here to sign up for the project email list.